Notes: Live music and other entertainment. After a several phase reconstruction, the beautiful COH re-opened the spring of 2007 for various events. In 1891 three brothers-in-law Anthony Bartak, Charles Wilhelm and Frank Votruba built this 1,200-seat Victorian opera house. Designed by E. R. Prall of Pontiac, the opera house was the first facility in Traverse City to use electric lights. It has a 43-foot ceiling, hardwood maple floors and excellent acoustics. Built as a meeting hall and auditorium, the opera house hosted concerts, traveling plays, vaudeville shows, high school graduations, dinners and balls. In 1920 a motion picture firm leased the opera house and closed it to avoid competition with its own film theaters. The building was used briefly during the Depression for a WPA project creating miniature city buildings. In 1971 it was listed on the national and state historic registers. 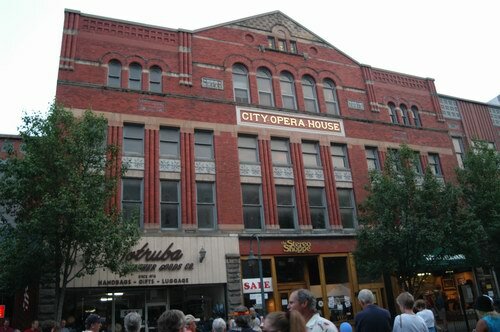 In 1978 the City Opera House Heritage Committee began raising money to restore the structure. In 1980 the opera house was given to Traverse City by the descendants of one of the original owners, Frank Votruba.